Contrary to an eyes-rolled-back-in-the-head, cliche of “ecstasy,” Youd’s performances are tamped-down and direct, focused and of duration, more tantric than histrionic. (They are also events in which no one is shot, brushes up against you nakedly or maintains eye contact for an interminable period.) The theatrical aspect is of a verité kind with a twist of surrealism. A man sits at a table in a publicly accessible place, reading and typing all day, day after day, with no overt theatrics, until one day he doesn’t show up. Youd is open to interruption by onlookers during his performances, but the real engagement is between the artist and the the book. This interaction is not entirely unlike many unwitnessed studio “performances” between artists and their work, moving in and out of a time-suspended “zone” of intense focus, except that in Youd’s case the artist is present to an audience – the studio is opened up to the observer – and the process of the work becomes the work performed. It is not open-ended or circular; it takes the time it takes to re-read and re-type the book in question, a process which yields re-typed “diptychs” as the evidentiary objects of his action. Youd’s diptychs are visually the counterpart to Steve Reich’s Piano Phase (1967; originally for piano and audio tape). Youd uses two pages in the typewriter simultaneously, as Reich employed a piano along with a pre-recorded performance of his score. In both cases the works are aligned as they begin, then gradually fall out and back into phase periodically; the same patterns are overlaid – imperfectly laminated – on the two “instruments” or two sheets. This superimposition creates some patterns which neither page/instrument alone evinces. 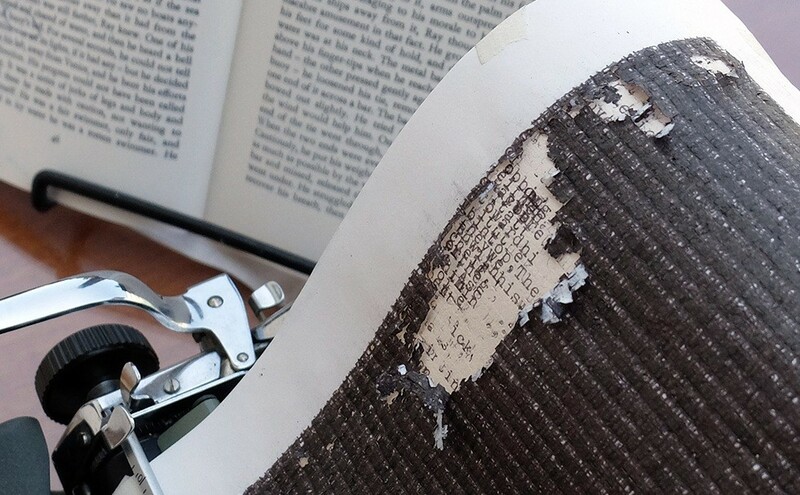 Youd’s top sheet eventually disintegrates in places, and the second, backing page receives all of the impacted ink. In these sections the “voices” diverge, a visual analog to Reich’s temporally shredded “phasing.” These “keyboard” works share the same sense of a deep concentration, a slow-burn intensity of duration and, more obviously, a repetitive, mostly staccato rhythm. 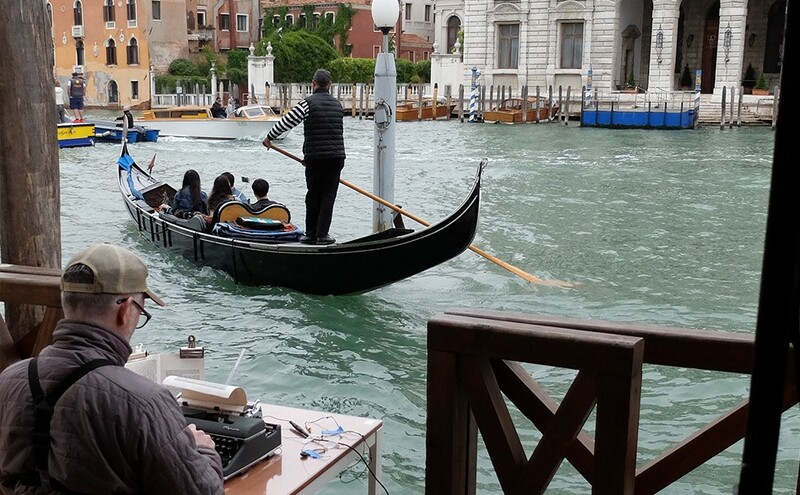 Musical performance is a temporally determined experience, as is reading; and an aural and tactile one, like typing. Tim Youd’s diptychs embody compression; of time, of the days it takes to read, to “perform” the entire book before him, and of the information carried by by the book’s letterforms and words. 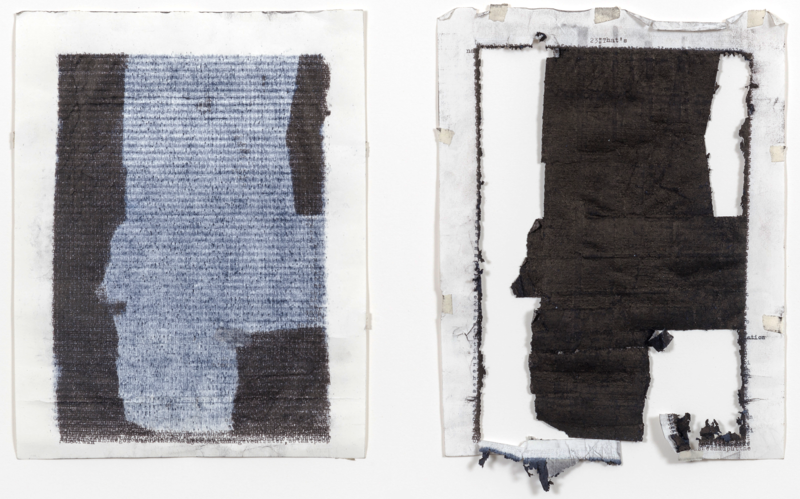 In this, the diptychs are reminiscent of the radical condensation of Idris Khan’s re-photographed and superimposed pages of books such as the Qur’an or Roland Barthes’ Camera Lucida (or Sontag’s On Photography , for that matter), which are each presented as an additive image of a single open codex, a bound “diptych”. Youd’s diptychs also function chronometrically, registering duration much as do Hiroshi Sugimoto’s series of photographs of old movie theaters taken in the 1970s. For these photographs, the camera’s shutter was left open for the entire length of a projected film, echoing Youd’s process of reading/typing books of various lengths, from beginning to end. Both the diptychs and Sugimoto’s photographs are evidence of durational performances. However, while the works of the three artists’ reflect some shared conceptual concerns, and in each case the work in question is the visible result of their respective processes, their examples highlight a major distinction between Youd’s diptychs and the others’ photographic works. Youd’s works alone have the physical, tactile qualities of objects rather than the unified, distancing surfaces of images. They have a direct, tangible correspondence to both the book and to the the reader/typist. The diptychs are not depictions or representations. They are objects tattered and shredded, nearly obliterated in their ecstatic making. Paul Bright / Hanes Gallery, in collaboration with: Tim Youd, Cristin Tierney Gallery (NYC), Z. Smith Reynolds Library-WFU, Reynolda House Museum of American Art, Weatherspoon Art Museum-UNCG.